2019 Four Winns HD180 Outboard. White with Phantom Gray and black stripe. Lunar and ebony interior. Gray Swim Mat. Four Winns Sure Load Trailer with brakes, swing away tongue and wheel jack. LX package with hour meter, depth sounder, lake water temperature, bimini top, bow scuff plate, pull up cleats, cockpit reed floor matting (Ash). SLX package with bow and cockpit cover, bow fill in cushion, swim mats and walk thru doors. 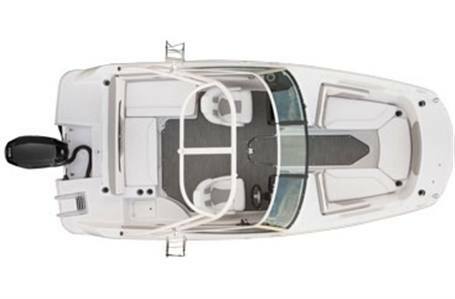 The HD 180 OB is a showcase of family-inspired, creature comforts and components tailor-made for exceptional boating. With its generous prescription for luxury, a subtle approach to well-designed convenience is appropriate: sofa-style seating is in full effect, and an L-shaped lounge to port fulﬁlls that ‘I'm right at home' necessity.